Chew Magna is on the B3130 road, about 10 miles (16 km) from Bristol, 10 miles (16 km) from Bath, 15 miles (24 km) from Wells, and 6 miles (10 km) from Bristol Airport, and the North Somerset coastal Towns of Portishead, Clevedon and Weston-Super-Mare are all within a 45 minute drive. 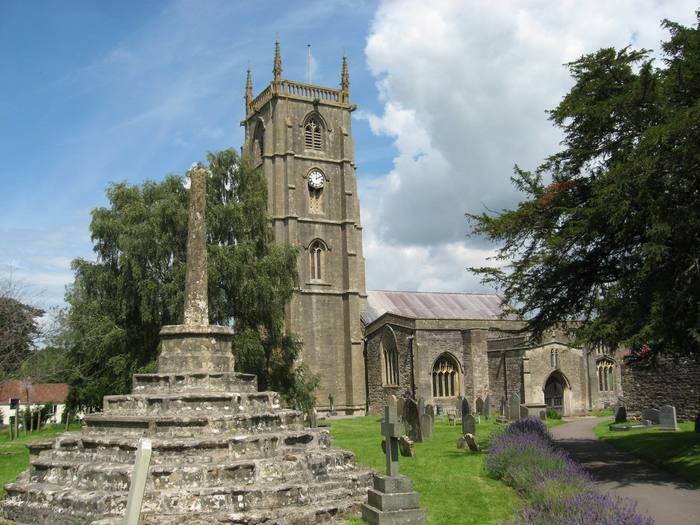 Situated within the Chew Valley in the Unitary Authority of Bath and North East Somerset, Chew Magna village and civil parish is close to the northern edge of the Mendip Hills (a designated Area of Outstanding Natural Beauty), and was designated a conservation area in 1978. To the south of the village is Chew Valley Lake, an important site for wildlife which has been dedicated as a Site of Special Scientific Interest (SSSI) and a Special Protection Area. There are many listed buildings reflecting the history of the village, which in Medieval times played an important part in the wool trade, and one of the Country estates of the Bishop of Bath and Wells. Two water courses flow through the village and Parish, The River Chew and Winford Brook. The village has approximately 1,200 residents. There is one primary school, and an adjacent secondary school, several shops and small businesses, three churches, and four pubs serving the area. In 2011 Chew Magna was voted “The Best Village in Britain”, in a Sunday Times survey carried out by Savills, and the village frequently wins regional categories in the Calor Gas ‘Village of the Year’ competition, and it is moving towards zero waste status, having been described as “probably the greenest parish in Britain”. Chew Magna is the largest village in the district, and can trace its importance back to Saxon times. It was a thriving woollen centre in the Middle Ages. The manor of Chew was held by the Bishops of Bath and Wells from 1062 to 1548, and therefore was called Chew Episcopi or Bishop’s Chew. The bishops built a palace near the church of St Andrews, which was visited by Henry III in 1250. Chew Court is a surviving part of the palace. More recently, since about 1600, the name has been Chew Magna because this has been the most important of the several villages along the banks of the River Chew. And the name Magna comes from the Latin meaning ‘the great’. 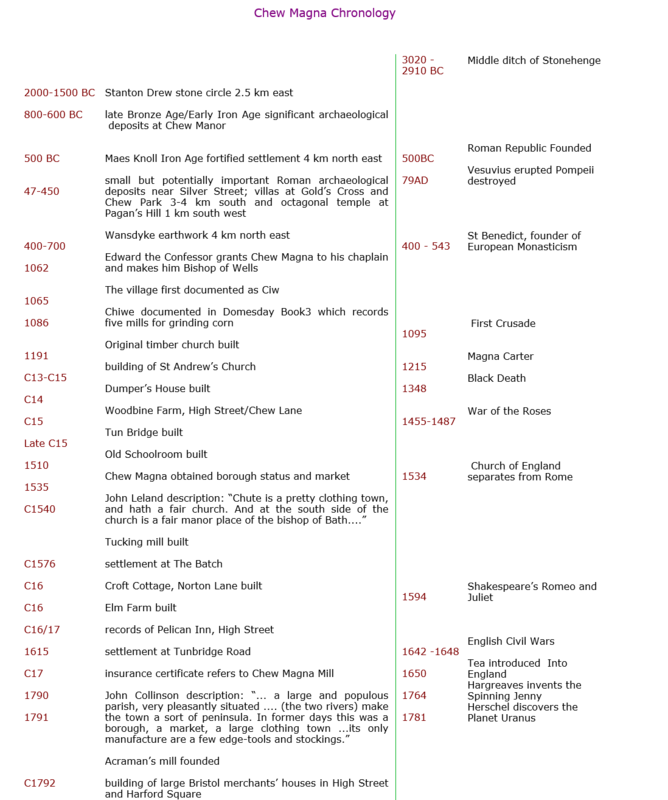 Until about 1880 the village had toll roads and a toll house to collect the fees. During the 19th and 20th centuries the importance of the wool trade in the village declined and it became largely a dormitory area for the cities of Bristol and Bath, although it has continued to be the commercial centre of the valley. During German bombing raids targeted on Bristol, Ruan House on the road to Chew Hill was bombed. The nearly flat area just east of the Y-junction on Chew Hill was initially chosen as a Starfish site area to be lit by fires to simulate Bristol in flames. Later, about half way between North Chew Farm and Manor Farm, North Wick, there was an area secured by RAF personnel, lit by fires, and with “automatic” guns to simulate anti-aircraft guns. There was also a genuine heavy anti aircraft battery at Chewhill farm. The area was guarded by pill boxes of which one remains on the west side of Blacklands. year, and two nature trails have been created. The flora and fauna provide habitats for some less common plants and insects. Around the lake refreshments and meals can be found at Salt & Malt. Some restricted use for recreational activities is permitted by the owner, Bristol Water, including, nature trails, dinghy sailing and fishing, primarily for trout. On 10–11 July 1968 a storm brought heavy rainfall to the Chew valley and Dundry, with 175 millimetres (7 in) falling in 18 hours on Chew Stoke, double the area’s average rainfall for the whole of July, and flooded 88 properties in Chew Magna with many being inundated with 8 feet (2.44 m) of water, and the parapet of the bridge on the road to Dundry was swept away. The Chew Magna telephone exchange was manually operated until the 1950s. An important number Chew Magna 2 was that of Doctor Hughes: the exchange operators could often locate him in an emergency even if he was away from his home and surgery. 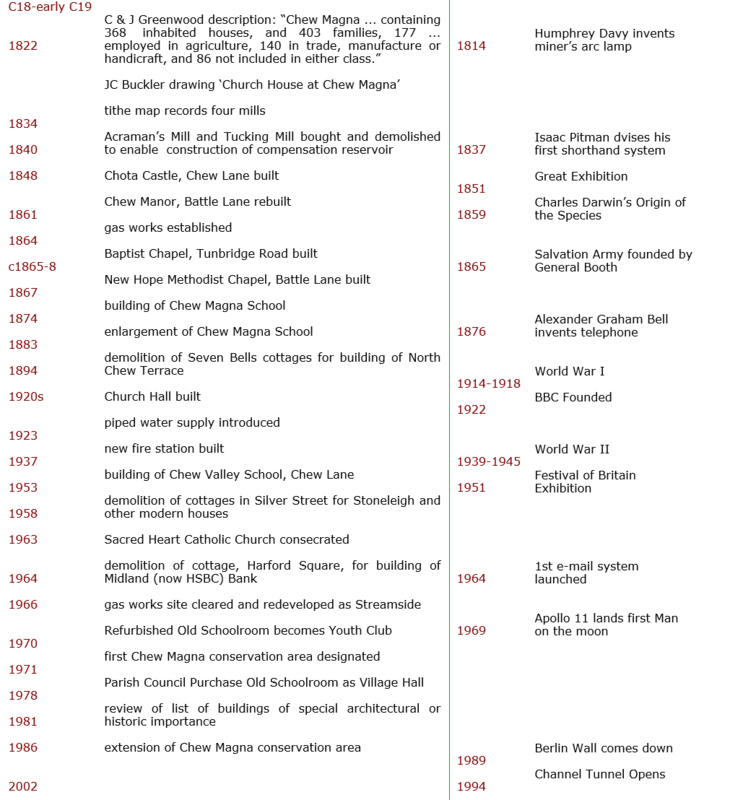 The manual exchange served most of the Chew valley and even East Dundry. Chew Magna has its own parish council, which has some responsibility for local issues, and is part of the Chew Valley North Ward, which is represented by one councillor on the Bath and North East Somerset Unitary Authority, which has wider responsibilities for services such as education, refuse, tourism, etc. The village is a part of the North East Somerset constituency, and is part of the South West England constituency of the European Parliament. According to the 2001 Census the Chew Valley North Ward (which includes Chew Magna and Chew Stoke), had 2,307 residents, living in 911 households, with an average age of 42.3 years. Of these, 77% of residents described their health as ‘good’; 21% of 16–74 year olds had no qualifications; and the area had an unemployment rate of 1.3% of all economically active people aged 16–74. In the Index of Multiple Deprivation 2004, it was ranked at 26,243 out of 32,482 wards in England, where 1 was the most deprived LSOA and 32,482 the least deprived. Chew Magna Primary School won a Becta award for the use of ICT in Practice in 2005 for using the adventure exploration computer game Myst to support literacy and communication. Chew Valley School is the main secondary school (11–18 years) for the valley. It is situated between Chew Magna and Chew Stoke. The latest (2004) Ofsted Inspection Report describes this specialist Performing Arts College as a mixed comprehensive school with 1,158 pupils on roll, including 196 students in the sixth form. It says the school is popular and oversubscribed, and has been successful in gaining a number of national and regional awards. Chew Magna is the home of the “Go Zero” project, which promotes education for sustainability at all levels in society, seeking to conserve and make improvements to the environment in the UK and overseas. The four groups within Go Zero are: Transport and Energy (which includes the Dragon flyer Mobility, a plan to develop a range of integrated services that offer communities in the West of England cost-effective, flexible and environmentally sustainable transport); People and Consumption (farmers’ markets, local food, skill swaps); Converging World (which supports campaigns and initiatives for social justice and development and is currently pursuing Fair Trade status for Chew Magna); and Waste and Recycling. It is based at Tunbridge Mill, a post-medieval watermill. St Andrew’s Church dates from the 12th century with a large 15th century pinnacled sandstone tower, a Norman font and a rood screen that is the full width of the church. In the church are several memorials to the Stracheys of Sutton Court together with a wooden effigy of a Knight cross-legged and leaning on one elbow, in 15th century armour, thought to be of Sir John de Hauteville or a descendant, and possibly transferred from a church at Norton Hawkfield before it was demolished. Another effigy in the north chapel is of Sir John St Loe, who was over 7 feet (2 m) tall, and his lady. The armoured figure is 7 feet 4 inches (2.24 m) long and his feet rest on a lion, while those of his lady rest on a dog. The church was restored in 1860 and has a register commencing in 1562. The tower is about one hundred feet tall and was probably built about 1440. There has been a clock on the tower since the early 1700s. There is a peal of eight bells in the tower. Tenor 28 cwt (3,136 lbs/1,422 kg) in C. The original five bells were re-cast by the celebrated Thomas Bilbie of Chew Stoke in 1735 to make a peal of six, and in 1898 four of these were re-cast and two were repaired by Messrs. Mears and Stainbank of London to commemorate the Diamond Jubilee of Queen Victoria. Two additional bells, the gift of Brigadier Ommanney, were added in 1928 to complete the octave, which still contains two of the Bilbie bells. The present clock, installed in 1903, plays a verse of a hymn every four hours, at 8 am, noon, 4 and 8 pm, with a different hymn tune for every day of the week. The church is a Grade I listed building. The churchyard contains several monuments which are Grade II listed buildings in their own right: the churchyard cross, plus a group of three unidentified monuments. In addition there is an early 19th century limestone round-topped stone which bears the inscription to William Fowler “shot by an Highwayman on Dundry Hill June 14, 1814 aged 32 years”. Within the church are wooden plaques commemorating the nineteen people from the village who died in World War I and seven from World War II, and a bronze plaque to an individual soldier who died in 1917. Near the church is a Grade II* listed building dating from the late 15th Century, and possibly one of the most important buildings in Somerset. This building was originally a ‘Church Ale House’, but is known now as the ‘Old Schoolroom’, which reflects its use as a school from the 17th Century. It was purchased from the ecclesiastic authorities in 1981 by the Parish Council, to become Chew Magna’s village Hall, and although the Parish Council are the custodial trustees of this remarkable relic of the past, it is run and managed by the Old School Room Charity Management Committee. Chew Court is another Grade II listed building near to the church, and is what remains of the Palace of the Medieval Bishops. When it fell into Secular ownership after the reformation, its status declined considerably, and it was restored in the 19th century and in 1976 when it was reduced in size. However the Gatehouse remains, practically unchanged, and contains a Turret room, said to have been used in medieval times, as a Court room. The Grade II listed building at the other end of the village, which for the last 100 years has been known as The Manor House is of Tudor origin. It was redesigned in Victorian Gothic Style by the architect John Norton in 1874, and amongst the brought-in pieces in the house are two South German reliefs, “The Martyrdoms of St Catherine and St Sebastian”, from an altar of the early 16th century, and a fireplace dated 1656. There are also a series of panels in the Floris style, probably Flemish and with a repeating date 1562. From 1680 to 1844 the Manor House was the home of prominent Quaker families including the Vickris, the Summers and the Harfords. William Penn preached here in 1687. The house has 4.9 acres of gardens laid out in the 19th century. The house is a Grade II* listed building and formed part of the Sacred Heart Convent School. Two of the stables attached to the Manor House are also Grade II listed. The high street contains many old buildings. The Beeches was built in 1762, with walls, railings, gates and piers of the same date, although the side wings were added later. Acacia House and Igbetti House, which was formerly known as Myrtle House, are from the same period, while Barle House, Holly House, The Sycamores and Portugal House are slightly more recent. On Battle Lane is the 18th century Rookstone House, which was formerly the end house in a row of seven, and The Rookery and its lodge, which were built in the early 19th century. Harford Square is dominated by the construction, in 1817, of Harford House and its accompanying stable block. Just south of the village is the medieval Tun Bridge with three pointed arches including double arch rings, spanning 60 feet (18 m) over the river, approached along one of the high pavements that are a feature of the village centre. It has three pointed arches, two of which have double arch rings built in two orders. At its widest point it is 17 feet (5.2 m) wide and 16 feet (4.9 m) in the centre. The two main arches are separated by a sharp cutwater 3.5 feet (1.1 m) and tapering to 8 inches (20.3 cm) above which a 4 inches (10.2 cm) string course runs throughout the length of bridge. The bridge is thought to date from the late 15th century and is a Grade II listed building and a Scheduled Ancient Monument (Avon No. 159). The raised pavement and steps are themselves also listed Grade II. Surrounding the village are several historic farmhouses including Dumper’s Farmhouse, which dates from the 15th century, and Knowle Hill Farmhouse, dated 1763.